Cosmetic clay is a natural antiseptic: it removes toxins and toxins from the body, it also has anti-inflammatory and antibacterial effects. 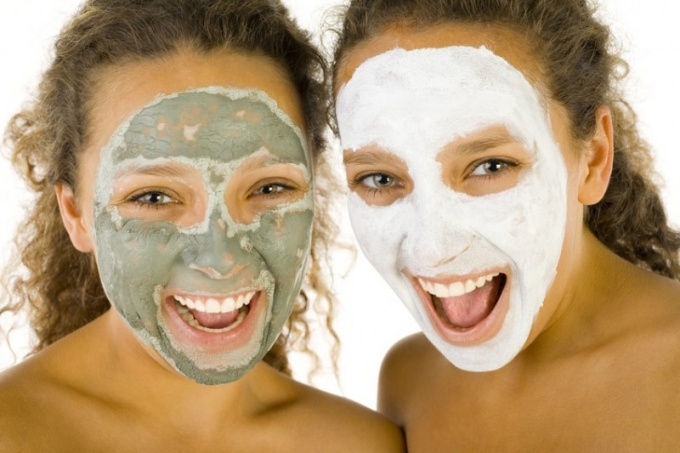 Such clay, for example, can be used as the main component of masks from acne. Get rid of pimples will help a cosmetic product made from 4 tsp. white clay, 2 st.l. water and 1 tsp. badyagi. The therapeutic mixture is applied to the face, leave for 13-15 minutes, then rinse the mask with boiled water, cooled to a comfortable temperature. After a quarter of an hour, apply a moisturizer to your skin. This procedure should be performed overnight: the mixture may cause allergies, so it is best not to use it before going out. Refreshes the skin and helps to get rid of pimples remedy, cooked according to the following recipe: 2 st.l. black clay, 1 tsp. lemon juice, 2 tbsp. chamomile broth (on 100 ml of water, take 1 tsp dry inflorescences of chamomile). Fill the clay with chamomile broth and mix well the ingredients (there should not be any lumps), then add the lemon juice. Finished product put on the skin and leave for 20-23 minutes. After rinse your face with cool boiled water. With sensitive skin to fight acne, use a mask made from 3-4 tsp. pink clay, 1-2 drops of aromatic tea tree oil and 3 tsp. decoction of calendula (for its preparation, take 1 tsp calendula on 100 ml of water). Cosmetic clay pour a warm decoction of marigold, mix well the ingredients, and then enrich the composition with essential oil. Cover the skin with this gruel and leave the mixture for 20-22 minutes. Then wash with cold boiled water. It pulls the expanded pores, reduces greasy shine, and also helps to get rid of acne cosmetic, whose recipe is: 1 tsp. olive or other vegetable oil, pulp of one kiwi, egg white hen and 1 st.l. green clay. Grind the pulp of the kiwi pulp into a gruel, add the vegetable oil, green clay and beaten in a delicate foam protein, then mix the ingredients. Nourishing mass apply to the skin of the face, and after 10-13 minutes, wash with cool boiled water. With teenage pimples, a mask made of 0,5 st.l is beautifully struggling. blue clay, a little water and 3-5 drops of apple cider vinegar. Mix the vinegar with cosmetic clay and enter into the mixture a little warm water (should get a paste-like mass). With the finished compound, cover the problem area of ? ?the face and leave the mask for 8-10 minutes. Then wash with cool boiled water.